Tópico em 'Astronomia' iniciado por Gerofil 26 Jun 2014 às 01:30. Explanation: The Sun set on Friday the 13th as a full Honey Moon rose, captured in this well-planned time-lapse sequence. 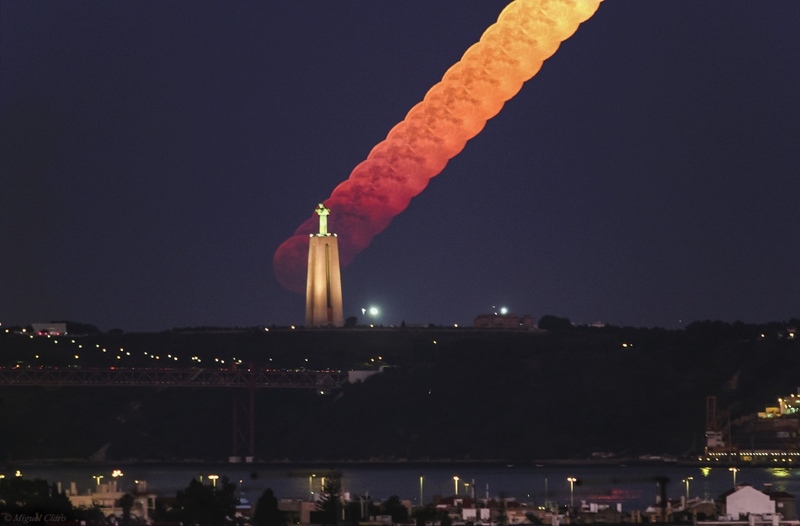 Lisbon, Portugal's Christ the King monument is in the foreground, about 6 kilometers distant from camera and telephoto lens. During the days surrounding today's solstice (June 21, 10:51 UT) the Sun follows its highest arc through northern hemisphere skies as it travels along the ecliptic plane. At night the ecliptic plane is low, and the Full Moon's path close to the ecliptic was also low, the rising Moon separating more slowly from the distant horizon. Northern moon watchers were likely to experience the mysterious Moon Illusion, the lunar orb appearing impossibly large while near the horizon. But the photo sequence shows the Moon's apparent size did not not change at all. Its light was initially scattered by the long line-of-sight through the atmosphere though, and a deeper reddened color gave way to a paler gold as the Full Moon rose into the night. Z13, Thomar e CptRena gostaram disto.